African coastal areas are increasingly prone to coastal challenges. The Niger Delta coastal areas are exposed to physical alterations due to natural and anthropogenic influences. In addition to current and projected extreme events such as flooding, erosion, sea-level rise, and heat waves, other conflicting factors increasing the vulnerability of the coastal Niger Delta range from the rapid shift in demography, urbanization, unsustainable land use, and inadequate implementation of relevant policies to oil spillage and gas flaring. All these issues, in addition to climate variability, increase the vulnerability and threaten the resilience of the human and natural environment. 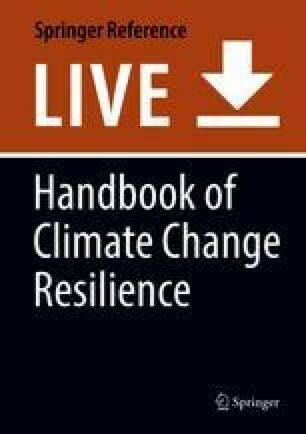 This chapter highlights the effects of climate- and weather-related extremes in the vulnerable riparian Niger Delta, based on existing facts and an empirical study, which gives insight on institutional challenges derived from the views of relevant technocrats, nongovernmental organizations, and stakeholders. Analysis of stakeholder views indicates some weaknesses and potential strengths of relevant institutions in addressing climate change issues through effective governance. Hence, scaling up institutional capabilities would enhance the resilience of communities and improve adaptive capacities. Key strengths involve employing existing institutional frameworks under relevant MDAs to climate-proof future coastal, riverbank, or lakeshores development.